Directions: If your glass is not chilled, do so by placing some crushed ice in it and set it aside while you prepare the cocktail. Place the 2 cups of crushed ice into a cocktail shaker. Pour the rum, lime juice, and simple syrup over the ice, cover, and shake well. Remove the ice from your serving glass and strain the drink into it. Serve immediately. Directions: Place the sugar and water into a small saucepan over high heat. Bring to a boil. Decrease the heat to medium and cook, stirring occasionally, until the sugar is completely dissolved, approximately 3 to 5 minutes. Remove from the saucepan and allow to cool completely. Syrup can be stored in an airtight container in the refrigerator for up to a month. My idea was to follow Alton Brown’s recipe, but instead of using the Simple Syrup, I opted to use the Koval Ginger Liqueur since I thought that it would be sweet enough to balance out the lime tartness in this cocktail recipe. All I can say is that the finished product was awful. It turns out that the Ginger Liqueur wasn’t sweet enough, so what should have been a boozy and refreshing cocktail with a lovely balance of sweet and tart flavors was way too tart and way too astringent. Two words: drain pour! What I should have done was stuck with the original recipe and then floated a bit of Ginger Liqueur on top to add a bit of spiciness to the drink. Better luck next time I suppose. 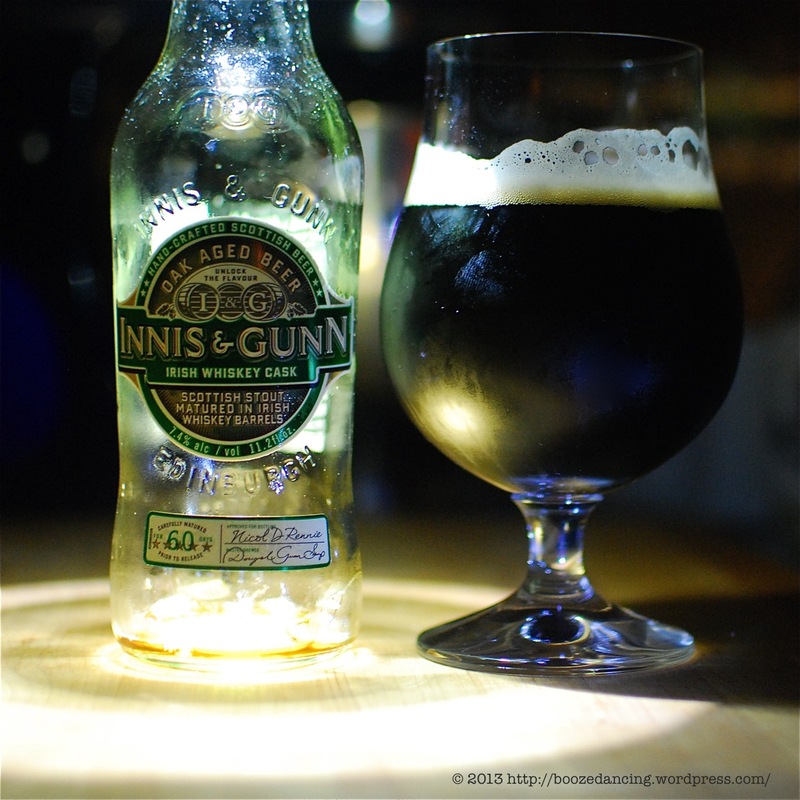 Since I royally screwed up my planned cocktail post, I decided to salvage my evening by reviewing this bottle of Innis & Gunn Irish Whisky Cask which Limpd was kind enough to give me. Our sturdy Scottish Stout gains even greater flavour during its maturation in rare oak casks, obtained from a renowned Irish Whiskey distillery. The resulting beer is rich, complex and velvety smooth with notes of coffee and dark chocolate, and proves that it pays to have friends in the beverage business. Appearance: Mahogany color with a thick, creamy tan head that dissipated very slowly. Aroma: There’s a rather subdued nose on this beer. I’m getting some medium roast coffee and bittersweet chocolate notes, with a wee bit of smokiness in the background. Taste: Lightly carbonated with a very velvety mouthfeel. The flavors are very consistent with what I picked up in the nose. Starts off with those medium roast coffee notes that have just a touch of soothing bitterness. As you approach the middle, bittersweet chocolate kicks in with just a touch of that smokiness. It all comes together in the finish with the added bonus of some lightly sweet milk chocolate notes. Mellow, lingering, and lightly bitter aftertaste. I must admit, what started off as a somewhat disappointing night after my botched cocktail experiment turned into a very pleasurable one thanks to the deliciousness that is this bottle of Innis & Gunn Irish Whisky Cask. This is a seriously easy drinking and well balanced beer with just the right amount of sweet and bitter elements. It’s also quite sneaky because until I looked at the label, I would have never guessed that it had an ABV of 7.4% since the gentle booziness of this beer doesn’t show up until it comes up to room temperature. My only criticism is that I can’t tell what influence the aging in Irish whiskey barrels had since I’m not picking up any Irish whiskey flavors. Minor quibbles aside, this is a superbly crafted beer that I recommend seeking out. Well done Innis & Gunn! I had the rum cask and enjoyed it enough to pick up this 4pk. I am glad I did and that you enjoyed it, too. Nice review. It was a fine purchase! I think this one was better than the Rum Cask. Mille Grazie for sharing!